Please remember that for this initial release, Hub can only create simple SD cards much like the Simple Show Builder. Please see the Light-O-Rama MP3 Directors topic for more information on how SD cards are created. 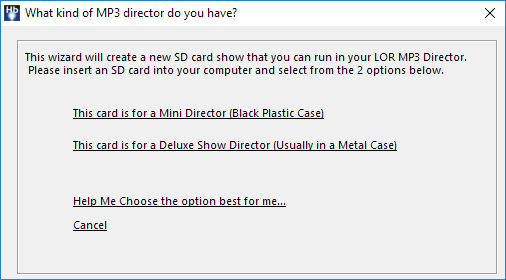 You should select the option for the MP3 director you own. LOR Showtime Central controllers all use the Mini Director, so you should select that. If you are unsure of which director you have, select 'Help Me Choose'. Hub will then show and describe the Show Directors we sell and have sold in the past so you can decide. 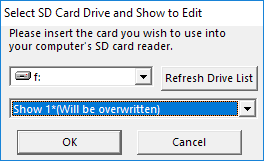 If you insert a different SD card into your computer, please press the 'refresh drive list' button. Up to nine shows can be downloaded to an SD card, and each will be assigned a number between 1 and 9. If two shows are scheduled for the same time, the lower numbered show will be played. Mini Directors do not have a time clock and so the lowest show number will always be played, unless you are using triggered shows. For this reason if you have a Mini Director, it is best to only ever create 'Show 1' to avoid confusion. Note for SD card shows that will run on a trigger: If you will be starting this show by using a trigger (a switch or other device connected to the trigger ports on the MP3 director) the show number selected here must match the trigger port you intend on using. So for example, if you intend on using trigger port #3, you must create this show as "Show 3".